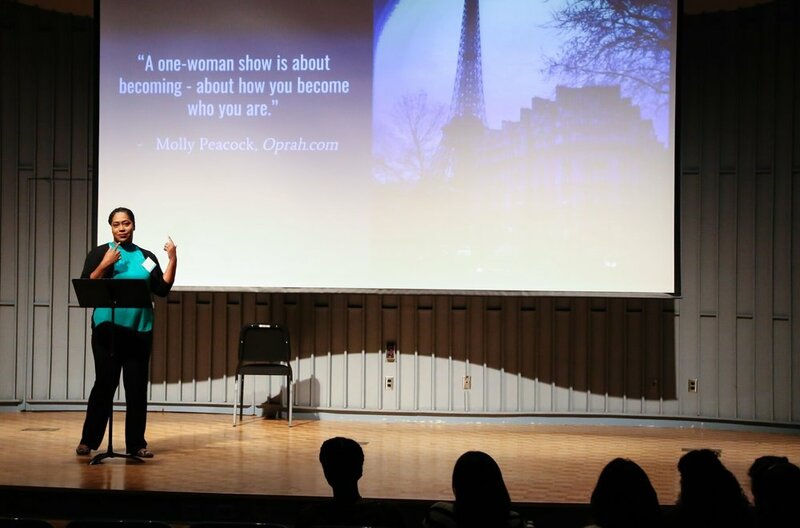 On October 7, 2018, Torie Wiggins presented a breakout session called “The Magic Stands Alone: The Importance of Solo Performance for Women in Theatre” at Statera’s National Conference in Milwaukee, Wisconsin. StateraArts is proud to publish a text version of her session below. One of the main reasons solo performance exists in theatre is to highlight and focus the story of one. One that has many faces and perspectives, but one body, one mind, and one soul. As of late, women have been forced to the forefront of the advocacy of our existence – why we matter, why our stories are important, and how we aim to take the lead in changing the world. When women and theatre come together, an inevitable magic happens. Through the magic of solo performance, women in theatre can use it to bring about awareness of critical issues and social change. A solo performance, sometimes referred to as a one-person show, features a single person telling a story for an audience, typically for the purpose of entertainment. This type of performance comes in many varieties, including autobiographical creations, comedy acts, novel adaptations, vaudeville, poetry, music and dance. Women were first permitted to perform on the English stage in the early 1600’s, after the Restoration of King Charles II. It is said that Emma Hamilton was the first known female solo performer, and she started in 1787. She re-imagined the concept of tableau-vivant, and her style became known as “the attitudes.” Her performance style inspired other women to perform in this way through the 1800’s. Solo performance historically has lived in many forms – “linked” monologues, monologue-dramas, mime art, avant garde, and performance art, just to name a few. Some notable women in solo performance include Ruth Draper, Cornelia Otis Skinner, Whoopi Goldberg, Beatrice Herford, Anna Deveare Smith, Holly Hughes, Peggy Shaw, Charlayne Woodard, and many, many more. What they all have in common is reinforcing the power of the woman’s voice in theatre. Women have always been the keepers of stories, problem solving, and empathy. And yet today, we still have a need to be seen. We have always taken responsibility for being the voice of the unheard, and not just in theatre. By becoming the voice of the unheard, and resisting being rendered invisible, we transform performatively into the complete opposite: being openly vulnerable, exposed, and seen. One commonality found in women’s solo performance is relatability of characters. Statistically, theatre audiences are mostly female – women make up 70% of theatre ticket sales, and 60-70% of theatre audiences. They know their audiences. Another is political and sociological commentary. Women performers tend to acknowledge historical triumphs and catastrophes from an emotional perspective, or how it felt. Another commonality is comedy. Comedy is steeped in vulnerability – the ability to be laughed at requires a level of vulnerability. And the final commonality is the stories are often autobiographical. Its women sharing their personal stories. It’s easy to think that solo performance requires one to be self-absorbed, seeking accolades and all the attention. But solo performance requires an actor to purposefully fill space. They must see the audience as their scene partners, sharing and connecting with them. The solo performance is about a specific narrative, and the actor must decide who gets to tell whose story, and lean into the ownership of said stories and all relationships involved. What’s the narrative? Do you have the authority or permission to tell it? In what way should this story be told? Qualify your authority over this narrative – how does it relate to you specifically? What will it consist of – vignettes? Multi-media? Puppets? Music? Poetry? Characters? How does this performance bring truth to power? Power being what the audience will leave with – you have this responsibility now! Spend a significant amount of time alone with the piece. Work it the same way you would a scripted play. Analyze your work and get it on its feet. Put eyes on it. Get a director or a trusted partner to objectively view your piece. Share it. Break that 4th wall and invite us all in. Newer PostSWAN Day 2019 is Coming! Older PostThe StateraArts Resource Directory is Here!